We love TV. And as technology has evolved, the collective industry has come up with ways to present better picture quality to make the final viewing experience more lifelike. Some of the improvements came through upgraded industry standards. For example, the entertainment industry has gradually increased screen resolution to make clearer images; from Standard Definition (SD) to High Definition (HD) and now Ultra High Definition (UHD). Another recent advancement is High Dynamic Range (HDR), which allows production studios, content distributors, and TV manufacturers to offer brighter and more colorful video. Some of the improvements come from innovations provided by each company. For example, when Samsung first introduced the LED TV, consumers were able to enjoy images several times brighter than conventional LCD TVs. In 2015, Samsung started to apply quantum dot technology to its flagship SUHD TVs. Now with more and more industry partners gearing towards HDR, the marriage between Quantum Dot technology and HDR offers viewers a whole new era of home entertainment. 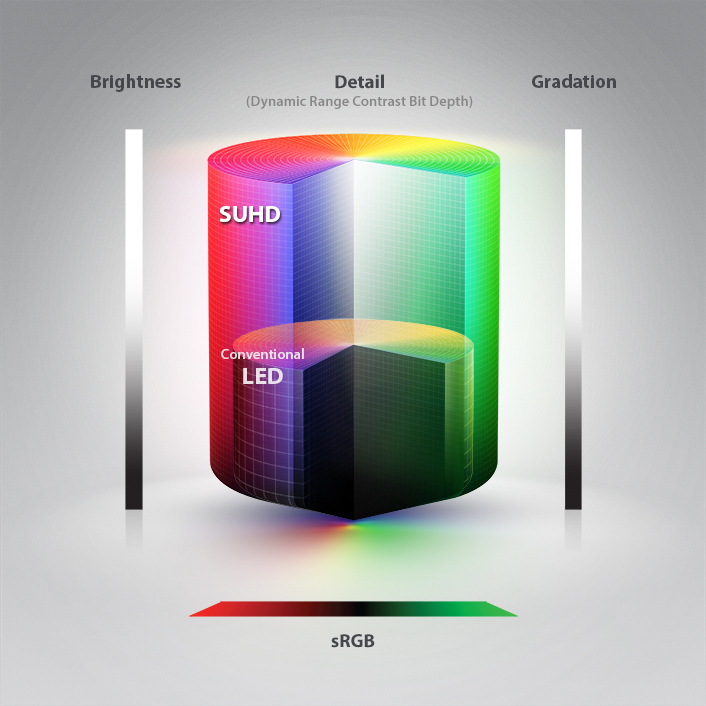 Although there are many devices that can show HDR content, not all HDRs are equal. Colors are perceived by light; and with the wider range of both luminance and colors for HDR, it is important that the TV can cover the brighter side of the spectrum. HDR1000 means the device is capable of showing at least 1,000 nits* at peak brightness. This intensity of luminance is considered an industry-top level. Dealing with higher brightness levels poses challenges as it normally means the display device consumes more energy. Higher brightness levels can also cause the device to generate more heat and without proper measures, excessive heat could pose a threat on the product’s lifespan. With SUHD TVs that feature Quantum dot technology, however, Samsung has an answer that allows TV sets to hit those brightness levels of up to 1,000 nits without the pain points. This is in part thanks to the photo-active property of quantum dots, which makes them very energy-efficient. Samsung was actually able to improve the overall energy efficiency of its 2016 SUHD TVs while enabling the set to hit 1,000 nits. Quantum dots also emit a very pure color, which helps quantum dot displays show much more accurate colors. And by using these accurate reds, greens, and blues, it is able to display broader range of colors. On the other hand, light from conventional fluorescents tend to get mixed with adjacent colors, dropping the range of colors conventional TVs can show. In fact, Samsung’s 2016 SUHD TVs with Quantum Dot technology are able to show up to one billion colors – 64 times more color than the average TV. Recent innovations in display technology offer us an exciting new era of home entertainment. Before you go looking for your next TV set, check where the industry is going and make sure your TV is best-suited for the upcoming wave of UHD and HDR content. For more information about HDR, Quantum Dot technology, and SUHD, visit: www.samsung.com/global/tv/quantum-dot-display. * A nit is a standard unit of luminance, frequently used in measuring the brightness of display devices. One nit is the luminous intensity of a candle lighting an area of one square meter.